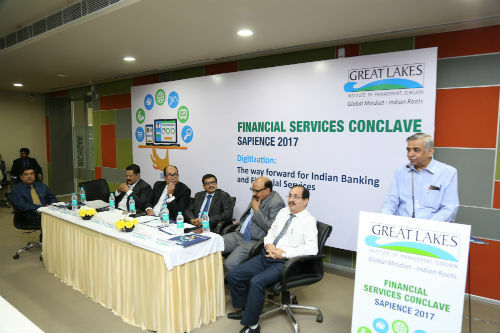 Gurgaon: Great Lakes Institute of Management, Gurgaon, a premier B-school in the country, hosted SAPIENCE 2017 – Financial Services Conclave at its campus in Manesar. The Conclave was graced by the presence of Dr. C S Mohapatra, Addl. Secretary, Ministry of Finance, Govt of India as the Chief Guest and Mr. Gagan Sardana, Senior Vice President, HDFC Bank as the keynote speaker. The Conclave witnessed 11 distinguished industry experts having discussion on the theme “Digitization as the way forward for Banking and Financial Services”. Delivering the keynote address, Dr. C S Mohapatra, Addl. Secretary , Ministry of Finance, Govt of India, said, “digitization has brought various reforms in the financial sector, it has offered benefits such as cost reduction, greater efficiency and financial inclusion. At the same time, it also has a drawback – cyber threat. Cyber threat is one of the major concerns that we are facing in the financial sector, globally. However, to tackle this problem we have set up bodies such as CERT-FIN(Computer Emergency Response Team in Financial Sector), which will work closely with all financial sector regulators and stakeholders on issues of cyber security and FSLRC (Financial Sector Legislative Reforms Commission) which works on improving financial sector and technology implementation, ensuring more transparency focusing on consumer protection. We are also trying to set up financial data management system that will integrate all the systematic data at one place for analysis. Further, he said, handling NPAs is a major issue in banking. We must contemplate how technology and data analytics can help manage NPAs”. Addressing the gathering, Mr. Gagan Sardana, Senior Vice President, HDFC Bank, giving an overview of Indian financial sector, he shared with students that, “there are ample job opportunities in the Indian Banking sector. With more and more technology interventions the newly regulated entities will start becoming important such as private lenders, credit unions etc. We have one lakh branches in the banking system, still only 53% people have access to banking system. But the government is focusing a lot now to bring rest of the 47% in the banking system and technology and newly regulated bodies play an important role here. One challenge where technology can play a major part is that there is need for different types of products to cover the various gaps that are there in banking system. Indian financial institutions employ 2.2 million people, 70 percent of this manpower sit in branches and have access to limited products and limited geographies. There are people who need these services and products but are not aware or the products cannot reach them. Good product design, good technology and training will play an important part in solving this problem”. The first panel discussed the topic, Renaissance of Indian Banks. The panel comprised Mr. SSK Pradhan, General Manager, RBI, Mr. Gagan Sardana, Senior Vice President, HDFC Bank, Mr. N Chakravarthy, General Manager, Axis Bank, Mr. Naveen Uppal, Head Risk, India Bulls, Mr. Subhash Kwatra, General Manager, Punjab & Sind Bank, Mr. Abhijit Roy, Former DGM, SBI and Mr. Mukesh Garg CFO, India Bulls. The panel said, “technology is changing everything and it is also playing an important role in evolving the banking sector. Further, the panel raised the question, what are the challenges that banking sector is facing due to this change and how to solve them? The panel shared that today we have around 10 to 12 lakh crores of NPAs. That is the stress that we have on our banking system. The public sector banks today are not lending money because a) the demand is less and b) they do not have sufficient money to give loan. The share of private sector banks can go ahead of public sector banks as public sector banks will not be able to lend but whether private sector banks will be in a position to lend for infrastructure projects is doubtful. A solution for getting in to better shape could be sharing of risk and regulatory accounting dispensing. Secondly, people need to be responsible. If we cannot repay the amount of money that we borrow then we should not raise money. One should do self-check and should do self- assessment and not to expand beyond one’s capacity. The panel concluded that banks today have become like supermarkets and all innovation is because of technological advancement. Banking today cannot operate without technology. Technology enables banks to offer appropriate products to their customers in a sustainable manner. The second panel discussed the theme, Fintech – enabler or disruptor ? The panel comprised of Dr. Sanjay Bahl, Director General, Computer Emergency Response Team (CERT), GOI, Mr. Rahul Sinha, Deputy General Manager, RBI, Mr. Nalin Bansal, Vice President & Head, Rupay EMV/Contactless National Payments Corporation of India (NPCI), Mr. Biswanath Sengupta, Consultant, Former Sr. Vice President and Programme Director, UIDAI, MSP. Giving the overview of financial technology sector, the panel shared, that there are over 750+ Fintech companies In India. This sector has immense potential, globally this is one of the most promising sectors today. India was ranked in the top 10 countries in Fintech market, globally in 2016. 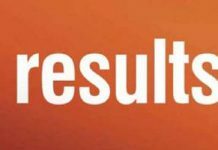 In India, there was a funding of 217 million dollars in 2016 in this sector alone. So, there are a lot of startups coming up in this field and there is huge job potential. The panel then raised a question as to how this fintech can be used for inclusive growth and how it can enable banking. The panel opined that banks offer multiple services and financial technology enables bank to distribute these services to the masses. India is one of the countries where technology is offering breakthroughs in the payment system. In future, fintech is going to play a large role in the concept of crowd funding and block chains as well but before that we need to ensure the security aspects. The panel said, there can be two types of fintechs. One type will provide financial services and the other will be in infrastructure and platform which will be used by other financial services firms. The second type of fintech will lead the growth because they will provide the technology which is required by the financial services provider. It will become a highly specialized sector Thus, financial services and technology are going to enable each other and technology should be called as a disruptive enabler.